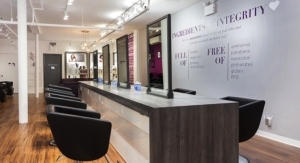 The Madison Reed Color Bar in New York City—once a pop-up store—was so successful that the online hair color purveyor decided to open up a permanent location on 11 W. 18th Street in the Flatiron District. It is the firm’s second permanent shop, and it marks the start of larger expansion project. In June, Madison Reed opened a San Francisco Color Bar adjacent to its headquarters. The company says it will open 20 to 25 new doors in urban areas or surrounding suburbs during the next 18 to 24 months. For $60, clients can get permanent color applied to their roots; for $35 and 35 minutes, clients can have an express root touch-up with Madison Reed’s new Root Reboot, a demi-permanent color service that lasts two weeks.